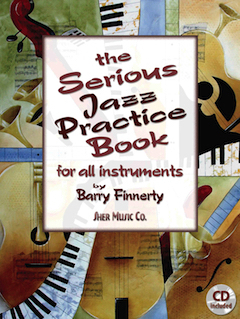 The Serious Jazz Practice Book by Barry Finnerty | Sher Music Co.
All musicians need to thoroughly learn their scales, chords, intervals and various melodic patterns in order to be complete musicians. The question has always been how to approach this universal task. THE SERIOUS JAZZ PRACTICE BOOK provides a unique and comprehensive plan for mastering these basic building blocks of jazz, on any instrument. It takes all the diatonic, pentatonic, chromatic, whole-tone and diminished scales and gives you step-by-step exercises that dissect them into hundreds of useable patterns. The same is also done for all the chord types and intervals inherent in each scale. 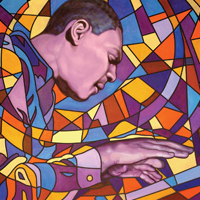 Many of the exercises are embellished with chromatic notes, giving them that jazz flavor right away. The companion CD has Barry demonstrating how to use the exercises to create great solos. The end result is a method book that will lead the reader to a deep, internalized understanding of the fundamentals of jazz.